When it comes to solving personal finance challenges, I like to have options. For example, my wife and I have 3 children (all under the age of 18) and for now … we assume all will attend college someday. Our goal is for each of them to graduate with a 4 year degree, with little to no student loan debt. My parents helped me get through college with virtually no debt. My in-laws did the same for my wife. And we plan to figure out someway to hack college expenses for our 3 kids. In order to do that … we need to be creative and leverage the many tools that are available to hack college. I recently wrote an article about one tool we plan to use to help pay for college … 529 plans. We have setup 2 of these 529 plans that will help pay for a portion of our overall college expenses. These plans will not cover the entire amount, but will get us started. So we need to find more tools that we can use to avoid taking on any student loan debt. After 529 plans, the next tool we plan to leverage for college expenses is … dual enrollment. Dual enrollment classes provide an opportunity for high school students to take classes at a local college and earn college credit. Many of these classes can often be counted as both college and high school credit. And most importantly, these classes are tuition-free for the student, which makes them a valuable tool for college hacking. 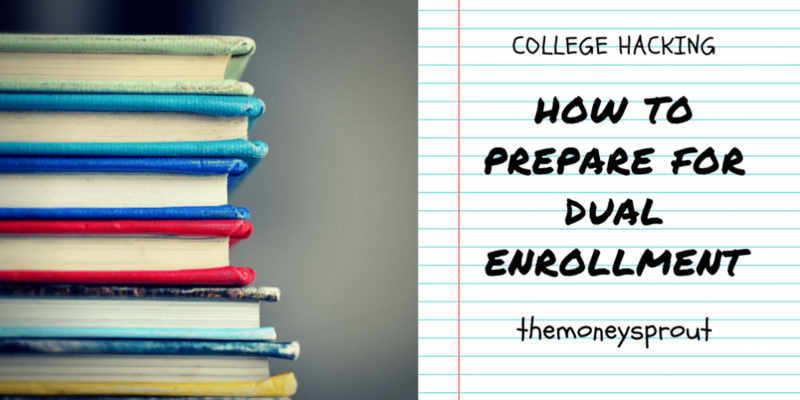 Taking dual enrollment classes can often help knock off semesters or even years towards a future college degree. All the while the student is earning credits towards graduating high school too! It is important to understand that dual enrollment programs will likely vary by state, so it is critical to do the research in your location. For example, we live in North Carolina … which offers a dual enrollment program called Career & College Promise (CCP). North Carolina high school students interested in this program can begin taking classes at a community college in their Junior and Senior years. In order to be eligible, students must maintain certain requirements … such as keeping a 3.0 GPA. Dual enrollment is certainly nothing new. 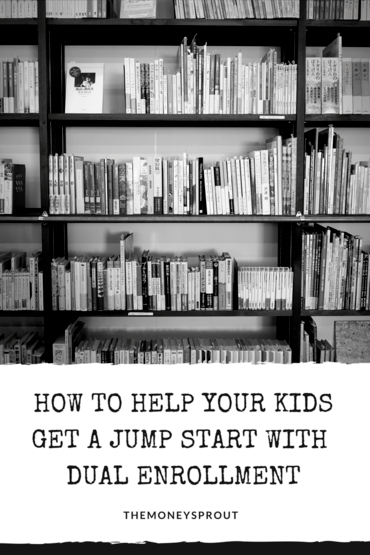 My wife was able to leverage a similar program when she was in high school … which helped her knock an entire year off of her undergraduate degree. We still have several years before our oldest child (currently in 8th grade) is eligible for dual enrollment. However, we are actively researching the eligibility requirements to participate in the program and are even getting a bit of a jump start. Assuming everything goes to plan, our oldest son (who is currently in 8th grade) won’t start taking dual enrollment classes until his Junior and Senior years of high school. Honestly, I prefer it this way as I want him to mature a little more before he takes classes on a college campus … even if it is community college. But even though he won’t start taking tuition-free college credits for a few more years, he is already taking his first steps towards dual enrollment. Based on the classes he has taken in 7th grade and now in 8th … he will have earned high school credit in 2 classes before starting his freshman year next fall. He is currently taking freshman math and a high school level Spanish class. Assuming he passes each (which it looks like he should) … he will have taken 2 of the required courses for high school credit. What Does This Have to Do With Dual Enrollment? You may be wondering … How does this help with dual enrollment? One of the perks of following the CCP program in North Carolina is there are no limits to the number of dual enrollment courses a student can take. Once they become a Junior, they can take classes in the fall, winter/spring, and even summer. So knocking off two high school classes even before becoming a freshman, should allow our son to take additional classes at the community college … as opposed to regular high school courses. We know a neighbor whose son did just that. He earned high school credits while in junior high, which allowed him to take more dual enrollment classes when he became a high school Junior. This student will now graduate high school a semester early … which will allow him to take a full load of dual enrollment classes his last semester of high school. And the best part of it all is that he can use those classes towards college credit. And better yet … they are tuition-free! Leveraging dual enrollment can be a great college hack for students and families looking to limit their expenses. I certainly don’t want my kids to take out a bunch of student loans that they will struggle to pay back someday. That is why we plan to use tools like dual enrollment to help earn tuition-free college credit. But while dual enrollment can be great, my wife and I want to make sure our kids won’t get burnt out either. We want them to enjoy their childhood years and not push them to be adults too soon. If at any point the workload or level of dual enrollment classes is too much for our kids … then we would need to reevaluate our plan and goals. I think it is best to approach things like dual enrollment in moderation. My wife and I recently discussed the concept of dual enrollment with our 8th grader. We explained the process and how he would be starting high school next year already with 2 classes out of the way. For him … it was a light bulb moment when we explained that dual enrollment could help him graduate college in possibly 3 years or less. And with very little debt. That really sold him on working hard in school the next few years, so we can leverage the dual enrollment program in our state. Have you or your children used dual enrollment to help hack college expenses? How many classes (or years) were you able to knock off?